This year, it is clear that a major priority for Enterprises needs to be to continue the fight against growing and evolving cybersecurity risks and vulnerabilities. With massive increases in crypto mining and email attacks still very prevalent, smart leaders are becoming very serious about mitigating security risks. Major organization decisionmakers are looking to Microsoft and are eager to gear up and take advantage of their brand new and updated features. These features are helping to improve efficiency and security by increasing IT Team bandwidth, reducing user error, and allowing you to see the bigger picture. Here are the three major updates and features and why you should be excited about them. In the modern world, there are a seemingly endless number of cybersecurity threats, risks, and vulnerabilities to be wary of, and there are just as many solutions and controls that protect against these threats. And while a great number of these solutions and protections are remarkably effective, many of them end up getting purchased and never used because applying and controlling all of them takes a serious amount of manpower. With the newly announced Microsoft Threat Protection, this issue finally has a solution. Building upon their massive experience crafting highly effective security operations, Microsoft has worked to bring together their threat protection solutions across email, documents, PCs, identities, and infrastructure into one, easy to manage system. 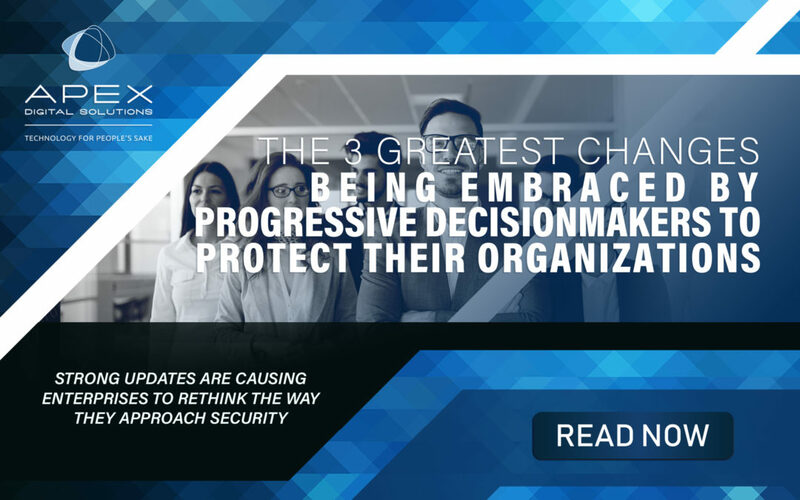 This end-to-end solution detects cyberthreats, corrects their effects, and protects organizations from being damaged by constantly new and future threats. This saves thousands of hours of work and management for overreaching IT teams, vastly improving efficiency and budget. You’ve been there. Whether you’re an IT professional or an end user, you’ve either felt or witnessed the frustration of constantly changing passwords and needing to remember dozens and dozens of solutions. You’ve also likely seen data breaches occur because of issues with weak, compromised passwords. Microsoft is clearly perceptive to this issue. Over the past several years they have worked to reduce the number of passwords needed with Azure AD Single Sign-On and Windows Hello. However, this year they have made the bold statement, “we are declaring an end to the era of passwords.” Microsoft is delivering new support for password-less login with the fully featured Microsoft Authenticator app. This app is connected with the hundreds of thousands of Azure Active Directory apps that businesses and individuals utilize every day. Whether it be through phone authentication, fingerprint, face-recognition, or PIN, the era of needing to remember dozens of passwords is ending and it begins with Microsoft. With compromised passwords proving to be the number one security liability for enterprises, Microsoft’s Authenticator app will make this issue a thing of the past. As mentioned before, one major issue that many organizations face when it comes to cybersecurity is utilizing too many solutions and controls that they may not know which are the most effective. In fact, most enterprises report that they have access to more than 60 security solutions, and yet have a lack of knowledge of the controls. This, and with the new and changing threats, there is an overall erosion of what these controls even covers. More blind spots are forming every day. With Microsoft Secure Score, organizations have a constant report card for the cybersecurity solutions. "We are declaring an end to the era of passwords." With these remarkable changes and updates to the Microsoft security apps, you can be sure that your organization’s cybersecurity protection will improve immensely, and efficiency within your IT departments will allow you to focus on the bigger picture. If you’ve recently experienced a breach, or are worried that you might be at risk for a cyber attack, then its time to reassess your security environment. We can help.